No consensus exists on how best to reduce Government borrowing, with the public divided between maintaining spending and increasing taxes (38%), cutting spending on public services (29%), and doing nothing (31%). If cuts have to happen, three-quarters of the public would like to see some services protected (77%). Overseas aid and benefits are the most common candidates to be cut, while the vast majority think the NHS should be protected from cuts (82%). The Guardian’s Data Blog has another excellent graphic with a commentary by Larry Elliott, their Economics Editor about Public Spending. 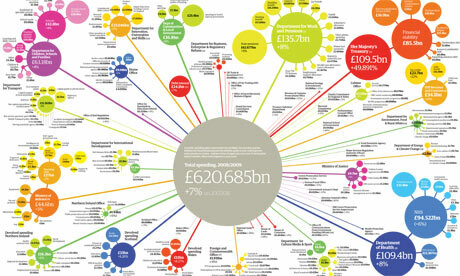 The graphic representation of government spending in the UK makes clear where tax revenues go. A quick glance reveals why it is that the politicians are so much keener to discuss the black hole in general than specific terms. The biggest blobs are for health, pensions and family benefits (DWP and Inland Revenue) and education. These three big areas have been growing as a share of the total near- continiously since the Second World War, and are of course the toughest to trim. The fourth big blob, however, is different – the £109.5 bn spent by the Treasury, and increase of an extraordinary 49,891% in the last year. This money, of course, is that which has been used to “save the world” by bailing out the banks. By contrast, those few things which politicians are most keen to talk about cutting explicitly are tiny. Quangos are of course a favourite target – the dots for Electoral Commission and the Postal Services Commission, for example, are barely visible. The blog invites members of the public to suggest ways in which they would make cuts to public spending. Here’s one idea from the comments for somewhere to cut and somewhere to spend a bit more: Ministry of Defence £44.6 Billion, Department for International Development £5.2 Billion. According to Ipsos Mori’s poll that commentator, who I happen to agree with, is in the minority. The Guardian’s Datablog continue to produce interesting and topical graphics and data sets… I think they need a permanent link.